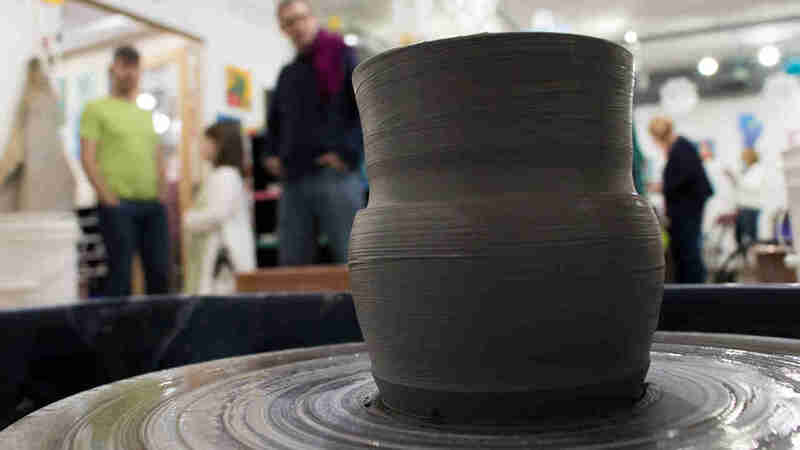 WHAT: In beginner wheel throwing class, learn the basics of working with clay on the wheel. You will learn the proper techniques and methods of keeping the clay piece centered and balanced as well as how to pull the clay up into a cylinder or bowl shape. No experience needed and you will be amazed at what you can learn during this class. Beginner wheel throwing class is an excellent pre-requisite to our advanced wheel classes. You may create as many pieces as desired in the time of the class and any pieces you choose to keep will then be fired and ready for you to glaze with ceramic paints in the design and colors of your choice. You may come in any time during business hours for the glazing process with no reservation required. Finished pieces include clay used, paint glazes used, and two firings at just $2.50 per inch on the longest side. This is a class for ages 13 and up. Please see our Kids Wheel Class for ages 6 to 12. Or you may book as a group with any age for private group class.